JEDDAH — Custodian of the Two Holy Mosques King Abdullah has extended the term of Prince Sultan bin Salman as secretary-general of the Supreme Commission for Tourism (SCT) for another four years, a Royal Court announcement said yesterday. Prince Sultan has held the position since the organization was formed in 2000 to build and organize the Kingdom’s tourism sector. 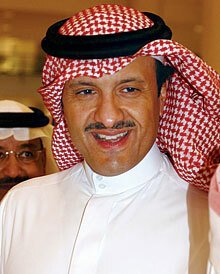 He has played a significant role in drafting Saudi Arabia’s tourism strategy and tourism-related rules and regulations. Sultan holds a master’s degree in social and political science from the Maxwell School of Citizenship and Public Affairs, Syracuse University, in the United States. He is the first Arab and Muslim astronaut — Sultan was a payload specialist aboard the US space shuttle Discovery in 1985. He is also a founding member of the Association of Space Explorers (ASE) and chairman of the founding committee of the Saudi Aviation Club. He has won the King Abdul Aziz Sash, a certificate of appreciation from the Lyndon B. Johnson Space Center, the National Aeronautics and Space Administration, and received top state honors from many countries including Bahrain, Tunisia, Pakistan, Yemen, Sudan, Oman, the UAE, Lebanon, Kuwait, Qatar, Morocco and Syria. He was also awarded an honorary Doctorate Degree in Science from the King Fahd University of Petroleum and Minerals in Dhahran. The SCT has been working to promote Saudi Arabia as a leading tourist destination in the world. The SCT plans to carry out a number of vital tourism projects this year. They include building a series of hotels and developing heritage palaces and historical sites in various parts of the Kingdom. Sultan said that his organization was conducting a feasibility study on building heritage hotels in association with the Finance Ministry and Public Investment Fund. Sultan said the commission had set out a five-year strategy for the development of antiquities and museums across the country, adding that the project would begin this year. The SCT recently announced new bids for the preparation of technological infrastructure for the Antiquities Agency and National Museum.